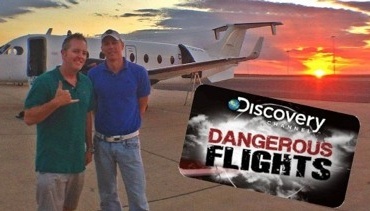 AeroExpo UK is excited to welcome Pilot Presenter Stu Sprung from Discovery Channel’s “Dangerous Flights” to the event. Stu will be included in the Free Seminar Series during the 31st May – 2nd June. Stu Sprung, from Discovery Channel’s program Dangerous Flights, is a commercially rated helicopter, air & seaplane pilot based out of California. The show, which features pilots delivering small aircraft long distances around the globe, has given him the opportunity to fly the world to almost 40 countries in a variety of aircraft. Before becoming a pilot, however, Stu worked as a firefighter/paramedic for the San Francisco Fire Department, and as a flight medic for the US Department of Homeland Security’s FEMA. As a result of almost two decades of public service he responded to thousands of federal, state and local emergencies in the US, including the World Trade Center attack on 9/11 and the 1996 Olympic bombing in Atlanta. A tragic on-duty accident brought Stu’s fire service career to a halt, and after a long rehabilitation and recovery he opted to pursue a career following in his grandfather’s footsteps as a pilot. His grandfather was the famous Dr. Jack Pickup, Canada’s Flying Doctor. He was the first pilot to navigate and map the route for seaplane pilots across the entire Canadian airspace, and his Canadian pilot license that he carried to the day he died was handwritten and was issued as #4. Since then Stu’s mostly flown in remote areas in entertainment and action sports for companies such as Honda, Red Bull, Calvin Klein, and now Discovery. In an effort to share some of his experiences with other pilots, Stu has created an aviation survival course. Growing up in British Columbia, Mexico, Guatemala, and El Salvador gave him experience and an appreciation for the wilderness. His background in the fire department, as well as being a paramedic and CPR instructor, will help provide pilots with the tools they need to survive should they ever find themselves in an emergency far from help.